Most farmers perceive cassava as a famine reserve crop that is mainly grown for food security during periods of prolonged drought. As such, they rarely add value to the crop which makes them incur huge losses especially when there is a bumper harvest, given that the fresh tubers have a very short shelf life. In Serere District in Eastern Uganda, a group of farmers from the Soroti Sweet Potato Producers and Processors Association (SOSPPA) have overcome this challenge by processing cassava into other products which have a longer shelf life. This has greatly diversified their income. “In the beginning, SOSPPA was just a farmers’ association dealing in sweet potato seed multiplication, processing and marketing. But later, when we saw that our cassava fields were heavily infested with cassava mosaic and cassava brown streak diseases, we decided to start multiplying clean cassava seed with the help of researchers from the National Agricultural Research Organization (NARO). The clean seed was distributed to our members and sold to other farmers who are non-members. Later when production increased, we embarked on processing and marketing our cassava. Now we are the largest producer and seller of clean cassava planting materials and processed cassava products in the district”. “Cassava is our staple food because it helps us to survive famine. It is a food bank which enables us to harvest only what we need for food or for the market. We therefore need varieties that mature early but stay longer in the ground without rotting because most of us don’t have storage facilities”. In order to diversify their incomes from cassava through value addition, SOSPPA developed an innovative product called Composite Baby Porridge. This product is made from a mixture of dried cassava (10%), dried orange-fleshed sweet potatoes (30%), roasted ground nuts (30%) and roasted sorghum (30%). The product is packed in packets of one kilogram which are sold at 4,000 Uganda shillings (about $1.2). Although this is a good innovation that is very nutritive and on high demand, SOSPPA still faces challenges of branding and certifying the product. The Cassava Community Action Research Project (Cassava CARP) which is funded by RUFORUM and implemented by the School of Agricultural Sciences Makerere University, is working together with SOSPPA to help them brand their product and have it certified. The Project has established a mother garden in the community where the popular local varieties that had become extinct due to CMD and CBSD were cleaned and planted to increase their availability to the farmers. 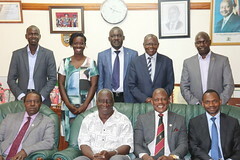 In addition, the project is following up with the Uganda National Bureau of Standards to ensure that SOSPPA acquires and registers a brand name, develops appropriate packaging material, and acquires the quality standards mark for its Composite Baby Porridge product.